Can I Make Only the Minimum Payment on Credit Cards? Are You Making Only the Minimum Payment on Credit Cards? 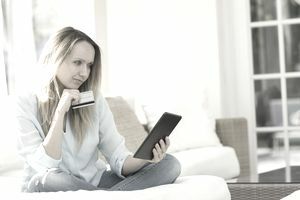 While making the minimum payment on your credit card each month may seem tempting, it's actually one of the worst things you can do from a financial standpoint. Here's why: The minimum payment on your credit card is determined by taking a percentage of your balance and charging you that percentage each month. This amount is a very small portion of your balance, usually between 2-5%. This size payment usually only covers the interest you are paying on your bill each month, so it never actually makes a dent in your principal balance. Using this method, it will take years to pay off your credit card – if you even pay it off at all. When you are only making minimum payments on your credit card, you are paying mostly interest. What's worse, your money isn't actively paying down any of your debt. Your credit score may also suffer, especially if you add to your balance by continuing to use your credit card. Keep in mind: The closer you are to your credit limit, the more negatively carrying debt will affect your credit score. To get out of credit card debt, you should set up a debt repayment plan, stop using your credit card, and pay more than the minimum balance. This can help you be more in control of your finances. When you look at your credit card statement, look at the amount you are charged in interest each month, then compare that to the payment you are making. Some credit cards will only require that you make a payment that covers the interest. Using this strategy, it will take you a long time to get out of debt. For example, if you have a credit card with a $6,000 balance, and make a 3% payment each month, this a $180 payment. Let's say your APR is around 14%, which is about average for a consumer credit card. It will take you 43 months – or 3.5 years – to pay off this credit card. And this is assuming you stop using the card altogether and the balance stays the same. If you're wondering how long it will take you to pay off a credit card, check your credit card statement. There should be a section that shows you how long it will take you to pay off the card if you make the minimum payment, as well as the amount you need to pay each month to pay off the credit card in three years. It can be discouraging to realize that you have years of credit card payments ahead of you. But there is hope. If you stop using your credit cards and really focus on getting out of debt, you can change the situation. It may take serious lifestyle changes and a moratorium on spending for a short period of time, but it will be worth the hard work and sacrifice to get out of credit card debt. You may want to consider getting a second job or consider implement as many savings strategies as possible to save more money and pay off debt more quickly. If you do not have a budget, now is the time to start to make lasting changes. You may also want to look at your income and expenses to determine if you need a long-term solution, such as a job change, that results in you earning more money. Continuing to use your credit cards will only worsen the situation. Don't assume that because you can meet the minimum payment requirements on your cards that you are OK financially. Making minimum payments on your credit card debt will not get you out of debt, and is not a long-term solution. Keep in mind that credit card debt drastically reduces your spending power. If you have too much, it can limit your choices when you decide to buy a home or a car. What's more, many credit card purchases are on goods or services that have no lasting value. Making a purchase on a consumer good using a credit card is not a smart financial move. If you want to get out of credit card debt, you need to make more than the minimum payment. You need to increase your payment as much as you can in order to avoid the amount of money you are wasting on interest and to help rebuild your credit. A good debt payoff strategy is to pay off one card at a time. Once you have paid off the first card, then move all that you are paying on it to the next card. Transferring your balance to a lower interest card can also help you pay down the debt more quickly. Using these strategies, you'll be surprised at how quickly you can get out of debt. Another tip? Once you have paid off your debt, you should consider closing some of your credit cards.